Sarcoptic infections: Caused by Sarcoptis Canis mites that make their homes inside the fur of animals. It can transfer to human skin if proper precaution is not taken. Demodectic mange: Wherein the weakening of the immune system of the animal is aggravated by Demodex mice. It never affects humans. Canine scabies, more popularly known as Sarcoptes scabei, is a form of mange that is caused by mites. The skin of the animal (the host) plays as the perfecting nesting grounds for the pregnant female mite, who keeps burrowing deeper and deeper into the skin. Unable to survive even a single egg-laying cycle of hers, the female mite dies immediately upon laying her eggs. Within 3-8 days, these eggs turn into larvae, which gradually grow into nymphs. When they become adults, they mate with each other, and their cycle of giving birth to their kind continues. A cool and moist environment is ideal for their growth. Yes, it is. If one of your dogs has it, you can be assured that your other dogs (if you have any) will catch the infection soon enough. Especially if they are in constant contact of each other. Keep in mind that these mites can survive without a host body for a few days, which means that your dog can get infected without coming in contact with another dog that suffers from mange. How to Tell If Your Dog Has Sarcoptic Mange? 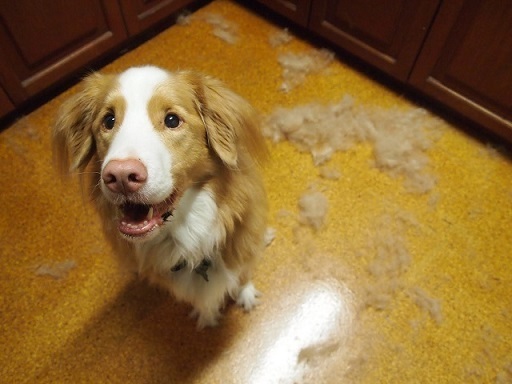 The easiest way to tell if your dog has mange is to check for: crust forming on his elbows, and unusual amounts of hair loss (especially on the chest, underarms or belly). He will also be constantly scratching/biting his infected body part with his paws in order to relieving himself of the constant itching. 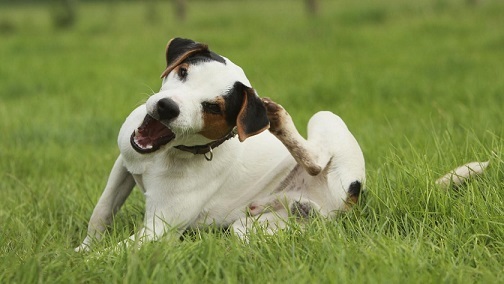 Excessive scratching can cause his skin to rupture, which would make it more vulnerable to infection. The first step is always isolation: From other pets as well as from your family. The second step would be to clean its belongings thoroughly – bed, clothes, toys, leash and collar. If there are things too difficult to clean, you need to get rid of them and purchase replacements. Next, you need to do a thorough cleaning of your home, especially of items your dog came in regular contact with – furniture, curtains, your bed, etc. Opt for vacuuming and chemical cleaning in order to completely rid your home of mites, otherwise your dog can easily get re-infected. Under normal conditions, Demodectic mange mites have a symbiotic relationship with dogs – they both benefit from each other’s existence. However, if pups are immune-suppressed, then these mites end up infecting the skin of the baby. 1. Demodectic pododermatitis: The toughest infection of the lot. 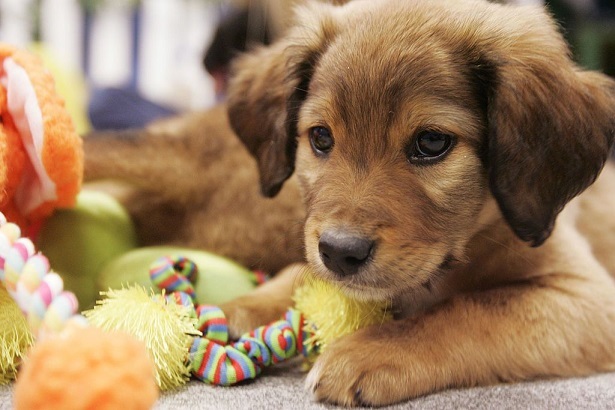 Often found in the paws of the dog, it causes bacterial infection to occur. Side effects include sores, scabs, bald spots and hair loss. 2. Generalized demodectic: Attacks large portion of the dog – sometimes its entire body. Foul odor and itching are very common symptoms. 3. Localized demodectic: As the name suggests, it affects localized or small areas on the body of the dog. It can most commonly be found among pups and often, the condition is taken care of naturally without any human interference. In the case of demodetic mange, it only transfers to dogs with weakened immune systems, because of which the infection has been classified as not contagious. Senior dogs and pups (the ones most likely to have weak immune systems) are the ones most likely to suffer from this infection. These dogs need not be isolated from other pets, until and unless they are immune-suppressed as well. And since this infection is due to genetic issues, it’s best to not breed your dog, otherwise the chances of his babies being infected increase phenomenally. Now that we’re clear on the question “Is mange contagious?”, we move on to its treatment. 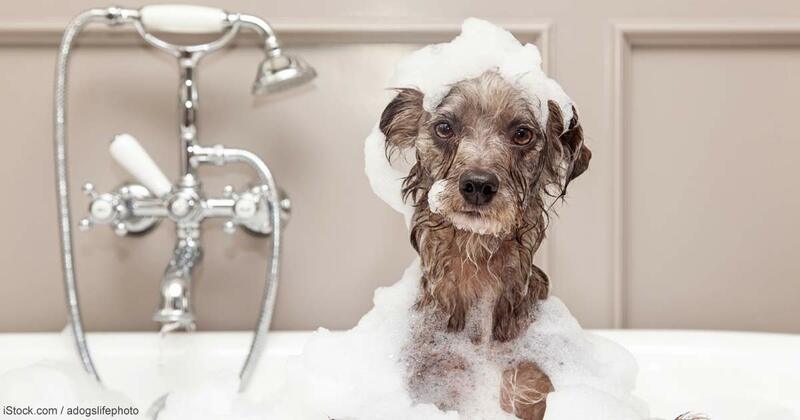 Treatment depends on the breed and age of your dog, as well as the type of mange he suffers from. According to that, his treatment might be oral (tablets, drops), topical (shampoo or soap) or via injections. However, in all cases, the dog is given anti-parasitic medicine to prevent the infection from spreading to others. Skin afflictions like irritation, inflammation or itching can easily be taken care of via medicines as well. Treatment usually takes over the course of 30 days to show positive results. Apart from the physical treatment, pet parents also have to keep in mind the physiological treatment of their dogs – they are often under a great deal of stress and face frustration due to the constant itching, which in turn might make them more irritable or aggressive. It is important for parents to be extremely patient and understanding of their dog’s behavior. Is There a Cure for Mange? If you have a pup or a young dog, the chances of their recovering completely from mange are high. However, adult/senior dogs usually need therapy extended over a long period of time in order to keep their mange under control. Why Is My Rabbit Pulling Her Fur Out?